NYC Educator: Can We Promote Governor 1% to Governor 4%, and How Do Charters Work? Can We Promote Governor 1% to Governor 4%, and How Do Charters Work? Lately, there's a lot of negative talk about Andrew Cuomo, what with his juvenile efforts to penalize teachers for not having supported his re-election. And let's face it, most of us took that position simply because he hates us and everything we stand for. Cuomo seems to think think we should look past that and support him anyway. A lot of people call Andrew Cuomo Governor 1%, because he represents the economic interests of only the very wealthy. But the governor has cast himself as a student lobbyist, and in that sense, he may also represent the 3% of NY students who attend charter schools. Sure, you say, he doesn't represent your students. He doesn't represent your children. And the way he advocates for his own kids is by sending them to private schools. You don't think Andrew Cuomo would send his kids to a Moskowitz school, do you? Who really wants their kids subject to endless test prep? But it's important to charter chains to appear to work miracles. That's why their teachers are at work 12 hours a day. That's why they bring work home, and many carry around cell phones so parents can contact them after work. Why should they or anyone have personal lives when there are tests to be taken? That's why so many of them do not last long in these test prep factories, and that's why kids who don't cut it are routinely tossed back into public schools. We take everyone, and are routinely vilified for doing so. A friend who works in a building with a colocated Moskowitz Academy told me she saw a kid admonished for coughing. The teacher asked if the kid was dying, and said if he wasn't, to just get back in line. This is an incredibly callous way to speak to a child, and any teacher who spoke to my kid like this would not welcome my reaction. In fact, Chancellor's Regulation A-421 protects schoolchildren from verbal abuse. Of course, such protections don't apply to charter school kids, who can be made to wear orange shirts, veritable dunce caps, for unwelcome behavior. There are no excuses, and basic human functions, like coughing, simply cannot be tolerated. Moskowitz had a hotline to Joel Klein, and she clearly saw her needs as more important than those of public schools. Friends of mine tell me that attitude trickles down to even the students, who have no problem ridiculing the public school kids, even for their handicaps, and whose teachers may even look on as they do so. There is clearly a separate and unequal environment, and it's bolstered by folks like Andrew Cuomo, who has no qualms about taking millions in contributions from charter supporters. They're certainly getting their money's worth. 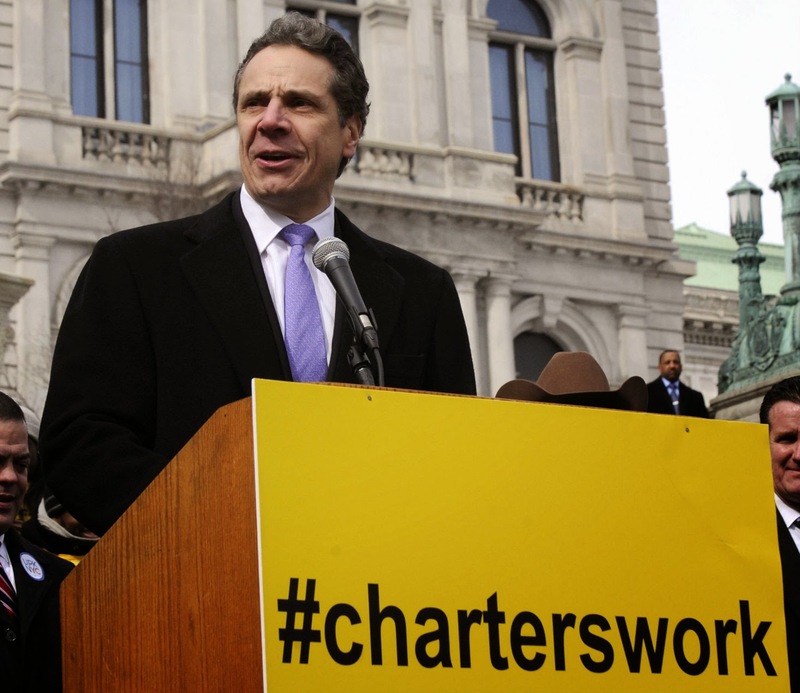 The National Association of Charter School Authorizers is less than bullish on NY. Of 21 rated states, NY rates 18, scoring only 7 of 30 possible points. While I don't spend a whole lot of time at Chalkbeat NY (since they've adopted their ponderous new user-unfriendly format), I read Rise and Shine every day, and haven't noticed their mentioning this. Every time Eva Moskowitz coughs, they have a feature. Every time E4E gets a hundred signatures urging more work for less pay, its a revelation. But this hasn't gotten a whole lot of play, if any, over there. In fact, I don't recall reading about this in the Post, the News, or even the faux-liberal NY Times. There's clearly a pro-charter bias in MSM, and I rarely see much beyond superficial analysis. If 100% of charter kids attend four-year colleges, but 66% of the cohort has dropped out or transferred to public school, what the hell sort of accomplishment does that represent? If they don't take ESL students or kids with special needs, like we do, what does that mean? And even if they do take those kids, how severe are their needs? Do they take kids from El Salvador who arrived last week, and who know not one word of English? Do they take alternate assessment students who will never earn a Regents diploma? We do. If charters were what they claimed to be, they'd take only the highest needs kids, and work their magic. If not, if they discourage entrants and get rid of inconvenient children, if they dismiss entire cohorts they find inconvenient, they are hardly Superman. Here's the big thing, though. Even if we disregard the miserable records of charter schools, if Andrew Cuomo, student lobbyist can't even guarantee that Eva's students are protected by the corporal punishment and verbal abuse regs that protect the kids I teach, who the hell is he representing? Certainly not kids who are dragged to Albany as political pawns on a school day. Certainly not kids who can be reprimanded for coughing, or kids who can be publicly humiliated by people whose job, ostensibly, is supporting them. Clearly Governor Cuomo represents the 1% who fund charters and fill his campaign coffers, and not any of the kids for whom he claims to lobby. This notwithstanding, in defense of Governor 1%, I have no issue with his upcoming trip to Cuba. I think it's great that he's taking the trip, and I wouldn't even mind if he did so with my tax dollars. My only reservations, frankly, are about allowing him back into NY State. Many of us who live here actually love our children and communities, and care intensely about even the 97% of our children who attend public schools.